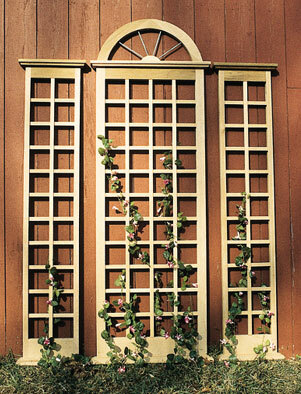 Emulating the beautifully proportioned windows popular in traditional buildings, this large, three-piece trellis incorporates a strong ¾" x 1" lattice and spoke copper mullions. One of our most popular solutions for classical wall enhancement, it is possible to alter the configuration of the units to suit a variety of space requirements. See line drawings for suggestions. Constructed of copper, western red cedar, Cambara mahogany lattice and stainless steel fastenings.